It still has the faint aura of a seaside resort for secret policemen. Today, of course, the Soviet system is a (slowly) fading memory, and the organizers of this year’s Yalta European Strategy conference could even make fun of Stalin in a specially commissioned cartoon. Yet Stalin’s ghost is not so easily exorcised. Although nearly 70 years have passed since President Franklin D. Roosevelt and a reluctant Churchill handed Eastern Europe over to the Soviet dictator, the old ogre still seems to haunt the Livadia Palace. After President Barack Obama’s fumbling over Syria, Russia is once again flexing its muscles — not just in the Middle East, where President Vladimir Putin is bidding for the role of power broker, but also in his own backyard. At Yalta in 1945 it was above all the fate of Poland that was at stake; this year it was the turn of Ukraine itself. “The most beautiful flowers often grow on the edge of the precipice,” said the Polish foreign minister, Radek Sikorski, during a debate about Ukraine’s European dilemma. Ever since the Ukrainian “Orange Revolution” in 2004, Kiev has been edging toward closer integration with Europe. This was the case under the now-jailed Yulia V. Tymoshenko, the former prime minister, but also under her jailer, President Viktor Yanukovich. 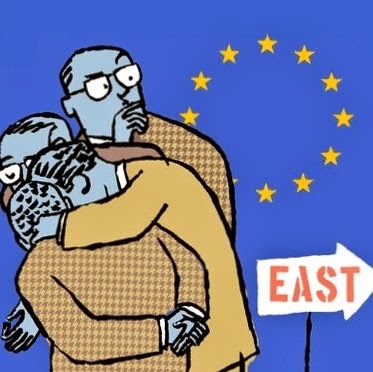 In large part thanks to Poland’s initiative, the European Union’s Eastern Partnership has become an antechamber for potential new members, covering not only Ukraine but a number of other “frontier” markets in the neighborhood, including Moldova, Armenia and Azerbaijan. Ukraine is the first of the Eastern Partnership countries to take the next step: an Association Agreement with the European Union. This is scheduled to be signed at the Eastern Partnership Summit in Vilnius, Lithuania, on Nov. 28. An Association Agreement matters because it implies a free trade agreement and also paves the way to a formal application for E.U. membership. The stark alternative is Russia’s proposal for a Eurasian Customs Union proposal. Speaking at the Valdai Discussion Club last month, Putin firmly denied that Russia was bullying Ukraine, Moldova and other nations to join his Eurasian union. But he noted that Russia was the main market for Moldovan wine and Ukrainian products. It was only honest, he said, to point out what they might lose by turning westward to the European Union. Putin’s chief economic adviser, Sergei Y. Glazyev, was at the Yalta conference and made the same kind of argument. Recent Russian trade restrictions on Ukrainian products — notably the ban on Roshen confectionary — were a warning against the “suicidal” step of signing the E.U. Association Agreement. One stumbling block to a deal at Vilnius remains Tymoshenko’s continued imprisonment. Yanukovich is under intense E.U. pressure to release Tymoshenko, who has been in jail since 2011 on corruption charges relating to a deal reached with Gazprom when she was prime minister (she was also briefly charged with murder earlier this year). According to both the Court of Human Rights and Council of Europe, her rights have been violated. But the real obstacle to Ukraine’s European future may yet prove to be the country’s chronic economic weakness. In this respect, Ukraine is indeed Hades to Yalta’s Riviera. The country’s foreign reserves are running out. Russia accounts for a quarter of Ukraine’s exports and the trade restrictions imposed this summer could cost up to $2.5 billion in the second half of the year. Cheap foreign finance has disappeared. Since May, Ukrainian bonds have plummeted. The answer to that question might in fact be yes, if in return Ukraine is willing to commit to meaningful reforms, both economic and political. For the European Union, this is another opportunity to do what it is best at: expanding. Those who have heaped scorn on European policy makers of the past three years tend to forget that, despite their strictures, the process of expansion has continued. Two new countries have joined the monetary union since the financial crisis began; a third will join in January. As for Kiev, if the choice is between following Poland’s lead or reverting to dependency on Moscow, like Belarus, surely the Ukrainians will choose the former. Not only do they have Poland’s example before them. There are the reassuring cases of Bulgaria and Romania, which are not a thousand miles behind Ukraine in terms of institutional development but which have been E.U. members since 2007. Recall, too, that — as the Hungarian example underscores — the European Union is far better at pushing change in nonmembers (during the accession process) than after membership is achieved. It will take time for Ukraine to raise its standards to the level required of E.U. members. But if the alternative is to be drawn back into the historic death embrace of a reborn Russian empire, Europe suddenly looks worth these sacrifices. We look forward eagerly to Ukraine’s first step toward E.U. membership. We also look forward to Yalta’s imminent rebranding as the Riviera of Purgatory.